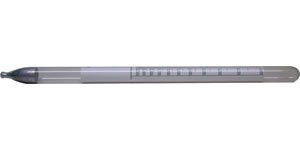 Hydrometer - 11.5" long, is used to measure the specific gravity of your mixed glazes or slip. This hydrometer works for both glaze and slip and measures 0 - 70 baume or 1.000 - 2.000 gravity. I find this sufficient for many (but not all glazes). Regardless of the method you choose, you'll need to tweak each of the problematic glazes for best results. Once you find what works best for you, write it down so you can repeat your successes.